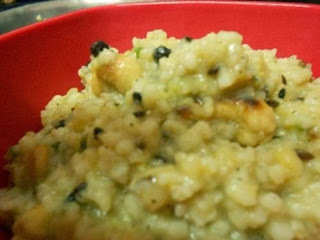 Usually venpongal is made with rice but I tried with broken wheat. This is a healthier version and Diabetes friendly. 1) Wash and clean Broken wheat and dal. 3) While cooking dal add a drop of ghee, pinch of turmeric powder and asafoetida. 4) Heat a kadai (wok) and add 1 tbsp ghee and sauté the cashews till light brown. Transfer it to a bowl. 5) Add curry leaves, cumin seeds, peppercorns and ginger and sauté in the same kadai. 6) Add the cooked Broken wheat, dal and salt to the kadai and mix well. 7) Finally add cashews and rest of the ghee. Tasty and healthy pongal is ready. Serve hot with chutney. 1) For pongal, we need to cook well by adding more water and extra whistles. The Broken wheat should be mashed well. 2) For extra taste, you can roast moong dal in ghee before cooking it. 3) If you dont want whole pepper corns, cumin seeds and curry leaves in pongal, you can mix them and grind coarsely in a mixture before frying them in ghee. 4) 1/2 cup of rice+ 1/2 cup of Broken wheat can be used in case if you don't prefer complete brokenwheat pongal.